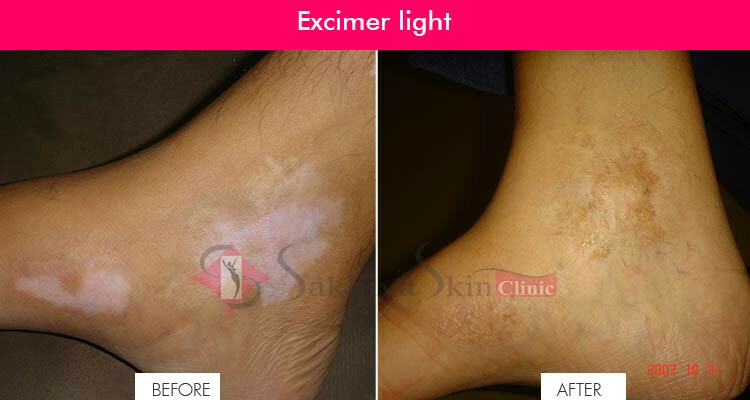 Excimer light is a type of laser light used in for treating dermal conditions. Excimer laser is a laser source of energy that is used for curing several dermatological diseases. Excimer light, in its universal mode of action, is excimer light method beneficial for confronting numerous skin troubles. It produces ultraviolet radiations of a particular wavelength of 308nm and has proven itself for treating a variety of skin disorders like psoriasis, vitiligo, dermatitis, allergic rhinitis, folliculitis, pustolysis, and leukoderma. Excimer light delivers ultraviolet B (UVB) radiations of wavelength between 309-312nm and has shown its efficacy more than any other laser treatments. When the UV radiations are directed to the spots or plagues then it covers only the affected region of skin and the surrounding area is not affected or is less exposed to those radiations. Hence, it is considered to be as one of the superlative treatment. Excimer light is a powerful kind of laser light which ensures promising treatment and focuses only on the affected region without harming the healthy skin. This light uses higher doses of ultraviolet radiations and generates nanosecond pulses. These pulses are then discharged on the plagues of skin disease. The laser light released is taken care of that it doesn’t fall less on the surrounding skin. Excimer light then lightens the patches of that localized region and nourishes the skin back like a normal one. With Excimer light therapy, patients need to take at least two treatments each week. It is considered that the treatment interval must be 48 hours. Excimer light can be applied to many body parts like- elbow, hand, knees, palm, feet, back. Excimer Laser Therapy is as effective as any other traditional light therapy. The light has a constructive effect on the skin disorder/s. It helps in improving skin tone and reducing redness caused by skin problems. Excimer light is used as a curing tool for many skin problems like - Psoriasis, Vitiligo, Allergic Dermatitis and Perforating Folliculitis. Causes: Excimer light treats diseases like Psoriasis, Vitiligo and all other dermatological troubles. When Melanin pigment (also responsible for maintaining the sanctity of the skin color) gets reduced or lessens itself then the spots are produced. Excess of stress also causes many skin imperfections. Few diseases like blood pressure and obesity also become one of the many factors for having dermatological problems. WHO IS BEST-SUITED FOR EXCIMER LIGHT THERAPY? Excimer light is a targeted portable UVB device, which works effectively & safely for patients of Vitiligo, Psoriasis, Eczema and other inflammatory and chronic skin diseases. Excimer light is FDA approved and extremely safe as it focusses and treats only the affected area/s on your body without making any changes in the area/s surrounding it. I HAVE WHITE SPOTS. HOW MANY TIMES SHOULD I TAKE THIS TREATMENT? Excimer light works very fast & is very effective compared to other skin treatment. Generally one should take 2-3 treatments/sessions every week for the initial few months and then go down to 1-2 sessions a week. Also, follow the prescription for oral medication & topical lotions for achieving optimum results. Excimer light therapy is the safest treatment for vitiligo. Sunlight has a broad spectrum of UV rays that tend to affect the unaffected area also. There are more dangers and side effects with sunlight like triggering of blisters, skin redness and itching. I AM DIAGNOSED WITH VITILIGO. CAN U TELL ME THE BENEFITS OF EXCIMER LASER FOR VITILIGO? It is a fast & effective treatment. Excimer light therapy will shorten your total time of recovery. Also, it‘s safe as it will only treat the vitiligo patches without causing any disturbance to the surrounding healthy skin. WHICH LIGHT CAN TREAT MY SPOTS COMPLETELY. WHERE WILL I GET GOOD RESULTS? White spots better respond on face, neck and trunk area compared to hands & feet. You must follow the advice & prescription given by the doctor for achieving optimum results.